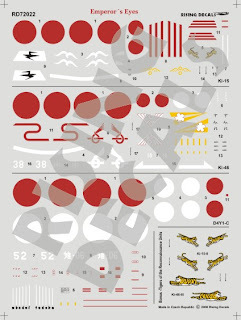 Japanese 1/72nd aircraft modellers have good reason to be grateful to Rising Decals for their continuing policy of producing themed decal sheets with unusual and much needed markings. 'Emperor's Eyes' (RD72022) includes unit markings and tail codes for a selection of both Army and Navy reconnaissance aircraft together with sufficient Hinomaru (Sun's Red Disk) for one of each of four aircraft types, the Army Ki-15 'Babs' (Type 97 Command Reconnaissance Aeroplane ~ '97 Shiki Shireibu Teisatsu-ki' or '97 Shi-tei') and the Ki-46 'Dinah' (Type 100 Command Reconnaissance Aeroplane ~ '100 Shiki Shireibu Teisatsu-ki', '100 Shiki Shi-tei' or 'Shin Shi-tei'), and the Navy's D4Y1-C 'Judy' and C6N 'Myrt'. As a bonus three pairs of tiger insignia for Ki-15 and Ki-46 aircraft of the 18th Independent Flying Company (Dokuritsu Hiko Chutai) have also been included. This is a lovely set. The Ki-15 options are particularly attractive and useful for the Hasegawa (ex-Mania) and LS (now Arii) kits still widely available. These include striking early markings for Ki-15-I types of the 2nd and 101st Independent Flying Companies in the form of stylised "birds", together with the "Chinese-style" tiger painted on the fuselage of an 18th Independent Flying Company example in tri-colour camouflage. In addition there is an attractive 8th Sentai option for a camouflaged Ki-15-II (LS/Arii) as flown over Burma. 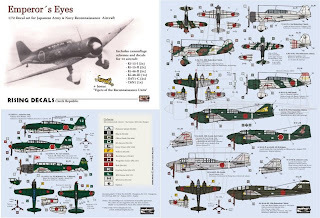 The options for the Ki-46 are especially appreciated with the availability of kits from LS (now Arii), Airfix and Hasegawa. The Hasegawa kits are becoming hard to find but I hope that Hasegawa and Airfix will re-release their respective Dinahs in due course. I actually prefer the Airfix example to the Hasegawa (shock, horror) as I believe it has more fidelity in overall shape and can be made into a very good looking model. The worst aspects, if you don't get wound up by raised panel details, are the poorly shaped spinners and the stalky, simplistic undercarriage. Aeroclub/Airwaves have a photo-etched detail set to improve this kit, especially the interior, and with the addition of the new Rising decals a very attractive example may be made. Dinah colours? Watch this space! Rising have included a most unusual Ki-46 tail marking, recently documented from photographs and tentatively identified as representing the 6th Air Army, together with more familiar examples from the 8th and 10th Sentai. In addition to the 55th Independent Flying Company, the sheet also has markings for a Ki-46-III 'Bukosho' winner of the 19th Independent Flying Company flown by Captain Masao Ohashi and Lieutenant Jiro Egawa. The bonus tigers are also very useful. These designs were originally painted on the 18th Independent Flying Company's Ki-46 aircraft by artist Takaki who lived in Hankow at the time and each one was different. The tiger marking was first adopted by Captain Yoshitsugu Aramaki in April 1939 and painted in the Chinese style on the fuselage of the Ki-15. In 1942 a member of the ground personnel Mamoru Tanaka painted an enlarged version of the tiger on the tail of the aircraft as a "tiger running in the skies" and alluding to a Chinese myth where the tiger could roam 1,000 miles in a day and return home. When the original Airfix kit included this marking back in 1965 they seem to have based its design on the then-current Esso petrol advert promoting the jingle "Put a Tiger in Your Tank"! The Navy options include a Rising Sun flag for the antenna mast of the C6N and the tail code '762-13' is provided as white or yellow alternatives. The painting instructions are clear, citing available hobby paints but avoiding the controversy or complicated mixes of some recent revisions with a disclaimer that these schemes are reconstructions of the possible appearance only and that for more accurate shades the modeller should check other related references . Photographic and profile references for each example are given. Rising have also included an addendum sheet that points to corrections to the colour schemes on their website. I particularly like the shade of red chosen for the Honomaru, which are deep and well saturated. The white borders are provided as separate backing pieces to aid in correct register. 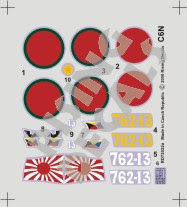 This set is a top quality, very well printed sheet of decals representing good value and filling a gap for 1/72nd modellers. Highly recommended. I received my copy of the Rising Decals sheet yesterday. Many thanks for the heads-up on its availability. Please post the stock number of the Aeroclub etch fret of details for the Dinah kit. It is now an Airwaves set AC72173/AW2173. Here is a link to the Hannants website catalogue page for this item and I shall also update the post.